WASHINGTON — The State of the Union address is usually the president’s moment to make his case with soaring words. But newly empowered Democrats on Tuesday delivered their own pointed message to President Trump and the nation: We’re back and we won’t be pushed around. 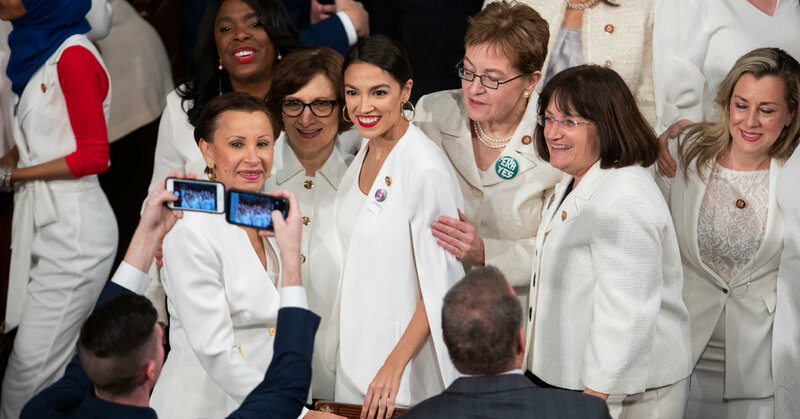 From the party’s restored “Madam Speaker” presiding over the proceedings to the sea of white worn by the scores of Democratic women crowding the party’s side of the chamber, the resurrection of the Democrats as a force in Congress was on full display. At his first speech before a divided Congress, Mr. Trump himself recognized their ascension with his plea for Democrats not to pursue investigations of his administration. There was zero chance of them complying with that request. Their invited guests — undocumented immigrants, sexual assault and gun violence victims, transgender Americans, federal employees who suffered in the shutdown — served as the personification of rebukes to the president and his policies. Also scattered through Mr. Trump’s audience on the House floor were multiple eager Democratic presidential aspirants whose goal is to take Mr. Trump’s job away from him in two years. The event had a different vibe from previous presidential visits to the Capitol for the annual ritual. That was not unexpected since plans for the speech had already been upended once by Speaker Nancy Pelosi — who returned to her old job in January — because of the record-long shutdown of the government caused by the conflict between Democrats and the president over his demand for a border wall, which Democrats consider unworkable and wasteful. The fight over wall funding persists. But the gulf between the Democrats and Mr. Trump goes much deeper than the border dispute. The disdain Democrats hold for this president was palpable in the chamber as they looked sternly on in mostly silent disapproval. Across the aisle, Republicans were left to provide the enthusiastic applause on which Mr. Trump thrives. The president’s call for compromise and comity struck many as particularly hollow after two years of angry tweets, recriminations and personal attacks that continued almost up until the speech. Democrats just weren’t buying it. “He is so disingenuous that when he starts talking about unity it is almost laughable,” said Representative Jim McGovern, Democrat of Massachusetts. “It’s hard to listen to a man with such a demonstrated inability to tell the truth — or even keep his word with members of either party — try to sell us on the idea that he’s now ready for bipartisanship and unity, that he’s poised to bring us together,” said Senator Sheldon Whitehouse, Democrat of Rhode Island. Mr. Whitehouse and other Democrats did commend the president for the military and law enforcement personnel he brought to Capitol Hill for recognition, but said there was a big difference between them and the president. Representative Lloyd Doggett, a veteran Democratic lawmaker from Texas, spoke for many of his colleagues when he called it “totally outrageous” for the president to use his nationally televised speech to try to undermine the special counsel’s investigation into Russian interference in the 2016 election and multiple inquiries that Democrats are now beginning into the Trump administration. The president essentially offered the Democrats a choice between reaching legislative deals or pursuing “ridiculous partisan investigations,” suggesting the country could not have both. To Democrats, if that choice exists, it is an easy one given that most don’t agree with the president on his legislative ideas. Many of them consider restoring congressional oversight — after two years of what Mr. Doggett termed Republican “overlook” — their prime responsibility after winning back the House in November. Perhaps the best illustration of Democratic sentiment toward the president was in how willing most of them were to sit during the speech and not yield to the impulse to join Republicans in their frequent applause of the president. In the past, lawmakers were uneasy about skipping the ovations for fear of being caught on camera not applauding some patriotic or uplifting moment and seeming disrespectful or churlish. But Democrats on Tuesday had no qualms at all about failing to applaud Donald Trump. They avoided any outbursts or walkouts that could have presented a bad image, but their silence as Republicans clapped repeatedly spoke volumes. The one big Democratic applause line of the night came at Republican expense. As the president was extolling the economy and the new jobs it had created for women in particular, Democratic applause became a crescendo as they realized that some of those new jobs were in the House of Representatives, where Democratic women had taken the place of ousted Republicans. They cheered and cheered. Mr. Trump then urged them to remain standing as he noted “we have more women serving in the Congress than ever before.” He was right, but the increased numbers were on the Democratic side, where women were outfitted in white in tribute to the suffragists of a century ago; House Republicans saw a decline in their women membership in the election. Unified Democrats are feeling confident in their approach after Mr. Trump relented in the shutdown fight and agreed to reopen the government without winning the wall funding. Despite his determined push Tuesday for the wall money, Democrats are very unlikely to give him what he wants in the ongoing negotiations to keep the government open past Feb. 15, though leaders of the talks say a chance for some compromise still exists. Democrats were careful not to completely dismiss the president’s call for bipartisanship, despite their reservations, though they sincerely doubted his sincerity. In his speech, Mr. Trump lauded his accomplishments and said, “We are just getting started.” For Democrats, the Trump era cannot end soon enough.